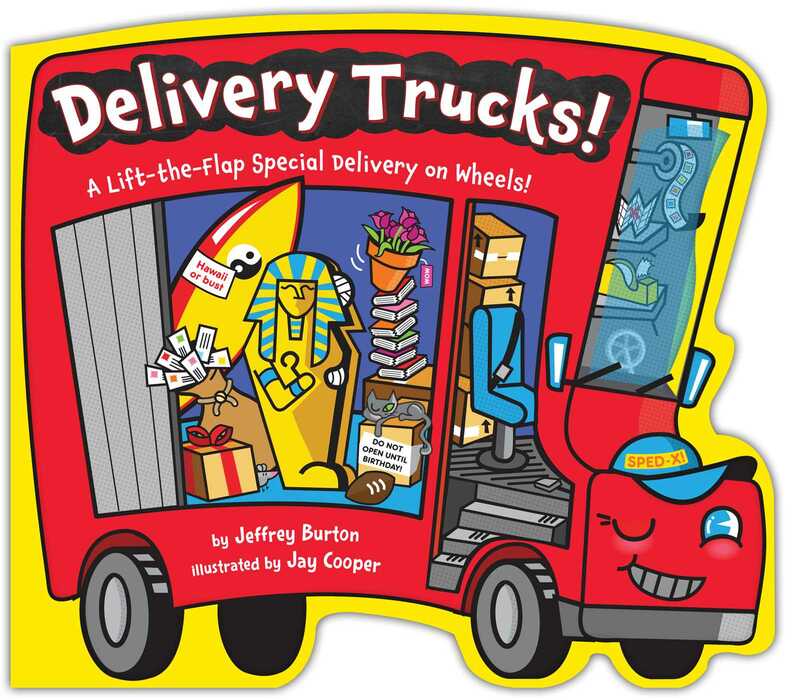 This truck-shaped, lift-the-flap board book about delivery trucks packs in all kinds of surprises. Beep! Beep! Look who’s driving down the road. It’s the Delivery Trucks! We deliver all kinds of different things to all kinds of different places. Take a look and see what’s inside! Welcome to Delivery Truck Central! Buckle up for a surprise delivery in this lift-the-flap story about trucks and all the special things they carry from town to town! It’s a green light to explore. From the mail truck, car transporter, pet adoption truck, and more, each spread is filled with special deliveries for readers to find under multiple lift-the-flaps. With inviting truck characters on each page, little ones will love finding surprises hidden in each spread as they learn more about trucks…and the important deliveries they make—two things that go, go, go great together. Jeffrey Burton has written several books for children. He lives in New York City with his family. Jay Cooper has worked as a creative director and designer of magazines, books, apparel. However, nothing makes him happier than creating and illustrating stories for kids. He lives with his wife and children in Maplewood, New Jersey. Visit him at JayCooper.CarbonMade.com. Jay Cooper has a masters degree in nutrition and is director of the "Body Code Wellness Program" for the world-renowned Green Valley Spa. Since 1979, he has been professionally involved in weight loss-wellness programs. The former general manager of the National Institute of Fitness, Jay practices what he preaches as a runner (twenty-four full-length marathons), a triathlete, a former personal trainer, and a cancer survivor. Book Cover Image (jpg): Delivery Trucks!